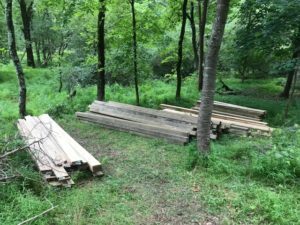 Yesterday a team of volunteers from the Raritan Valley Road Runners, Rutgers Outdoors Club and Student chapter of the Wildlife Society came out on a humid morning to carry in a huge stack of lumber a 1/3 of a mile into the woods. The lumber is to build a bridge and boardwalk on a new trail that is under construction in the western expanses of the EcoPreserve. There were a lot of sore shoulders and tired bodies by the end of the morning.